The Virtual Materials Market Place (VIMMP) is a H2020 funded project coordinated by Fraunhofer IFAM. 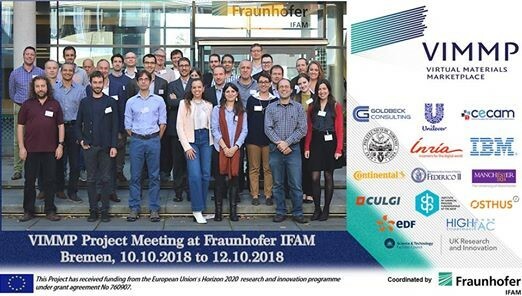 Together with 16 partners Fraunhofer IFAM works to accelerate the development and market deployment of new materials by embracing digitalization. VIMMP will establish a powerful digital marketplace serving beneficiaries from different manufacturing industry sectors. The digital marketplace enables an effective and widespread use of materials modelling by facilitating the exchange between providers and consumers of products and services and easing the uptake of knowledge and tools.